538 pages | 7 B/W Illus. Minority and cross-cultural psychology is more relevant now than ever in our diverse world. Given the dramatic local and global changes occurring daily with regard to demographics, population changes, and immigration issues, minority and cross-cultural psychology is fast becoming a respected and critical area of scientific study. Pair that with the fact that people of all cultures and racial groups are living longer and experiencing age-related diseases and disorders, one can easily see the need for additional work on issues related to neuropsychological assessment. This new edition brings to the forefront recent developments by seasoned experts in the field. They offer up their newest projects in minority and cross-cultural aspects of neuropsychological assessment and are joined by new, up-and-coming professionals across a wide array of disciplines including psychology, medicine, and neuropsychology. 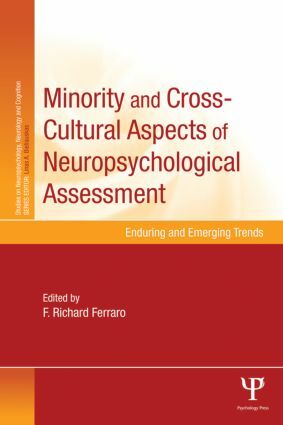 Like the first edition, this updated collection sheds light on the ever-growing need for adequate neuropsychological assessment to a wider subset of individuals, crossing many cultural and minority barriers in the process. Continuously pushing the boundaries of neuropsychological assessment, this collection is essential reading for cognitive and clinical psychologists, and neuropsychologists, and a model text for advanced courses dealing with minority and cross-cultural issues. Ferraro’s newly edited book continues to provide a solid foundation in cross-cultural neuropsychology and address existing gaps in the literature that characterizes historically under-studied and under-represented groups. Such clinical, empirical and theoretical insights are key in improving the quality of care provided to cultural and ethnic minorities. This new edition brings together updated views and valuable insights on cultural considerations for practice, training, and ethics in neuropsychological assessment. A must-read for psychologists who aspire to achieve best practices in working with culturally and linguistically diverse groups. This is an important book that covers a wide range of topics regarding neuropsychological assessment. I was particularly pleased to see many chapters on future issues that relate to neuropsychology and ethnic minority populations. Ferraro’s superb new edition contributes to a culturally rich neuropsychology with a stellar cast of authors who provide clinically sensitive, but also cutting-edge, information across a range of relevant theoretical and practical topics. F. Richard Ferraro is the Chester Fritz Distinguished Professor at in the Department of Psychology at the University of North Dakota. He is also Editor-in-Chief of Current Psychology, and a Fellow of the National Academy of Neuropsychology.